Anyone who hasn’t heard of the BBC’s Live Lounge Tour, you’re too late. It just ended. But while it ran, it was one of my favourite stops online. Basically, the show was exactly as the title suggested; getting together with artists, in an informal setting, such as their home lounge, and then get them to play songs (originals and covers)… live. There was an amazing intimacy and warmth that came across on these episodes, and I’m still extremely jealous of Jo Whiley for getting to host it. 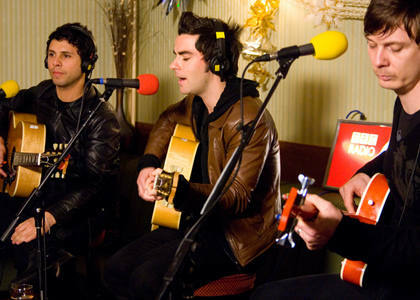 While it has drawn to a close now, I think that possibly one of the best shows of the season was saved ’til last, when the Live Lounge Tour chatted to the Stereophonics. The Stereophonics have had their ups and downs, and their hits and misses, but I’ve always been a big fan of Kelly Jones and the boys. Strangely, while most people were turned off by their seemingly more morose phase, I thought that the “Maybe Tomorrow” times were some of their best. Regardless, I’m sure that this appearance on the Live Lounge may have swung more hearts their way. The show started off with an interview at Kelly’s childhood home in Wales, and was then followed by an acoustic set at the Cwmaman Men’s Club, where the band had played their first show back when they were 13. The highlight of the show, and the reason for this very post though, was their cover version of the Foo Fighters “Best of You“. Kelly’s voice has never sounded better. It has the perfect blend of world-weariness and hurt; and of hope. You may not have the blatant Grohl anger here… but Kelly delivers this song in no less a forceful version. It’s as if he approaches it from the other side; a lonely, broken voice calling out in the darkness. It’s one of the most haunting covers I’ve heard in ages. Good on ya boys. Previous Post Jack Johnson’s New Album. And, another Christmas Cover. Next Post State Radio, Roger That & The Beautiful Girls at the Tivoli.